The Ricoh GR is a high-end compact and it’s clear straight away that with an overall score of 78, it’s actually pretty good. Good enough, in fact, to be ranked number 2 when compared to the other APS-C compact cameras tested in the labs. Even expanding the comparisons out to full-frame high-end compacts, the GR comes in third, behind the Sony Cyber-shot DSC-RX1 (full-frame) and the Nikon Coolpix A (APS-C) and ahead of the venerable Fujifilm FinePix X100. 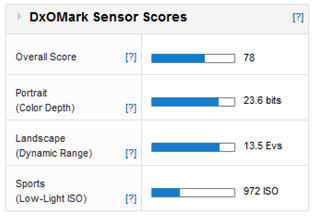 Looking at the GR in more detail, it’s clear that the sensor is very well rounded, putting in good scores across the board. In the portrait tests for color depth, a score of 23.6bits is very good, to put it into perspective, it’s almost identical to the score the Canon EOS 5D Mark II achieved just a few years ago. Equally, the dynamic range score of 13.5Evs sees it compete well with DSLR models, in this case, it’s on-par with the Nikon D5100. It’s only the low-light score that slightly lets it down – a score of 972ISO is good by compact camera standings, but does highlight where compact cameras still lag behind Full Frame models. In terms of negative points for the GR, there really are very few. Some may see the fixed focal length as a problem, but for many, it will be part of the appeal. And while it may be less versatile, a high quality prime lens will out-perform a lot of zoom lenses for image quality. 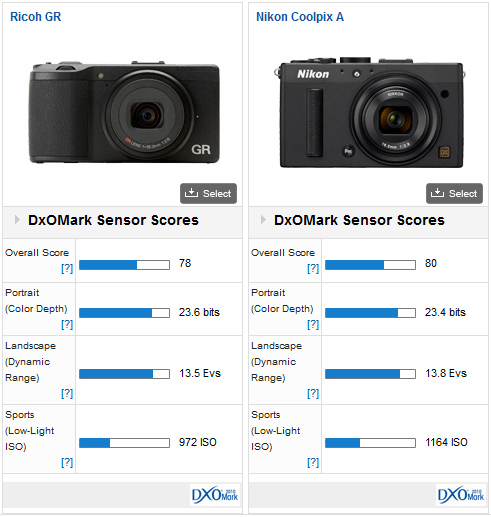 The Nikon Coolpix A is the current king of the APS-C sensor high-end compact cameras, so to see the Ricoh GR come so close in the overall score shows just how well it is performing. In fact, the difference of 2 DxOMark points is not discernible in final images so these two can be said to have essentially the same image quality. In the portrait tests for color depth, the Ricoh outscores the Coolpix A, but as with the overall scores, the difference is so minimal as to be invisible in the real world. The pattern continues in the landscape tests for dynamic range, though the Coolpix A technically comes out on top, mostly because at ISO 100, it is 1/3rd of a stop better than the Ricoh. It’s the sports test for ISO performance that sees the Coolpix A just pip the GR to the higher overall score, managing just a little less than a 1/3rd of a stop better, with 1164 ISO to the 972 ISO of the GR. While the Coolpix A is the current champion, the Finepix X100 has been around for a while and has been very highly rated for a while. 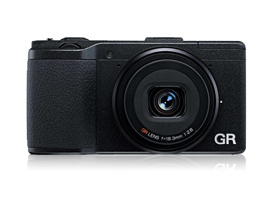 However, the Ricoh GR has now moved above in the ratings. The overall score difference of 5 DxOMarks is not a lot, but enough to be noticeable and is equal to around 1/3rd stop improvement in image quality. The higher score is a feature of better results almost across the board, with the GR scoring ½ stop better in colour depth, and 1 stop better in dynamic range. It’s only in the ISO scores where the X100 wins, but the difference is less than 1/3rd stop and hence not visible in final images. 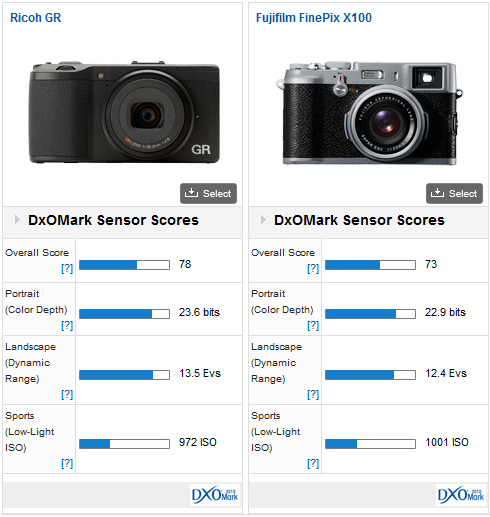 Note: the Fuji X100s is not yet measured on dxomark.com and could score maybe higher. The final comparison pits the GR against a DSLR from the same stable, the Pentax K-5 IIs. Both cameras feature broadly similar sensors approximately 16megapixel APS-C offerings, so performance could be close. And so it proves, with the Pentax only coming out on top by just about 1/3rd stop overall, with a score of 82 to the Ricoh’s 78. In color depth, there is very little to separate them, certainly not enough to be visible. It’s the dynamic range scores where the Pentax pulls ahead, scoring 2/3rd stop better than the Ricoh. 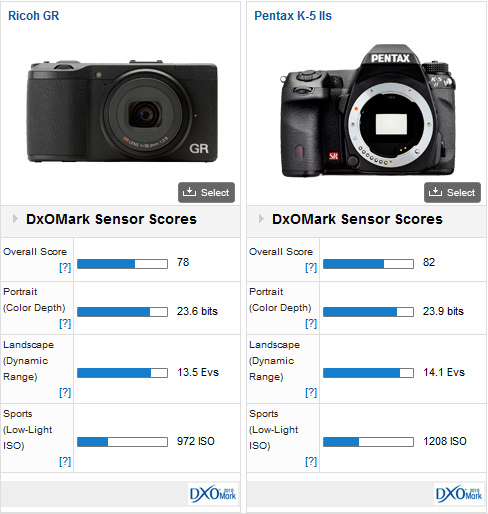 Surprisingly, and pleasingly for the Ricoh, their ISO scores are quite similar, with the Pentax being just slightly less than 1/3rd stop better – though for a DSLR, this is quite a high score compared to other APS-C sensor DSLRs available. Overall, the Ricoh GR has proved itself to be a very capable performer and it joins the Nikon Coolpix A and the Fujifilm Finepix X100 in moving on the performance level of prime lens compact cameras. While they don’t feature the versatility of interchangeable lenses, they make very high quality discrete cameras for street and social documentary photography, without having to make too many compromises in image quality along the way. It is an exciting sector and one that will no doubt continue to grow over the coming months.